The owner of an Iowa farm that recalled 380 million eggs this week as part of a nationwide recall in a salmonella outbreak has had multiple run-ins with prosecutors and regulators, who have said the man imposed "morally repugnant" working conditions and was a "habitual violator" of environmental laws. Jack DeCoster owns Wright County Egg, the farm linked to the salmonella strain in eggs that have already sickened more than 1,000 people. On Friday, the nationwide egg recall expanded to include a second Iowa egg farm in the ongoing investigation. 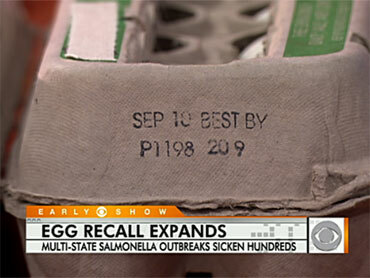 Wright County Egg is already facing at least two lawsuits related to the recall. One is from food distributor Dutch Farms, which says the company used unauthorized cartons to package and sell eggs under its brand name without its knowledge. The other is from a person who said they became ill after eating tainted eggs in a salad at a restaurant in Kenosha, Wis.
DeCoster has been cited for numerous health, safety and employment violations in the past. In 1997, DeCoster Egg Farms agreed to pay $2 million in fines to settle citations brought in 1996 for health and safety violations at DeCoster's farm in Turner, Maine. It's one of many stories the website Grist.org cited in a compilation of stories about DeCoster's past. Phone calls made to Wright County Egg in Galt, Iowa, were answered by an automated message directing callers to a recall hotline. On Thursday, The New York Times reported that those charges, brought by the Occupational Safety and Health Administration, included workers being forced to use their bare hands to handle manure and dead chickens. Farm workers were also forced to live in rat-infested trailers, officials told the newspaper. Reich also referred to DeCoster's farm as "an agricultural sweatshop." More recently, immigration officers raided DeCoster's businesses. In 2003, DeCoster paid another $2 million in a settlement with the federal government after he pleaded guilty to charges of knowingly hiring immigrants who were in the country illegally, the Times reported. In 2000, Iowa's attorney general called DeCoster a "habitual violator" of state environmental laws, a label that enhanced penalties for violations. At the time, DeCoster was fined $150,000 for violations at his Iowa pig farm, where "hundreds of thousands of pigs each year" were raised "in large confinement feeding operations." DeCoster was the first person to be classified a habitual violator in Iowa, according to the attorney general's office.